Learn how to calculate the Mean Kinetic Temperature (MKT) in stability studies of pharmaceutical drugs. Mean Kinetic Temperature is a useful tool used in pharmaceutical stability studies. It helps to calculate the degradation of stability sample. As per ICH guidelines Mean Kinetic Temperature can be defined as a single calculated temperature which degrades the same amount of the drug as degraded by the different temperatures during the particular time period. 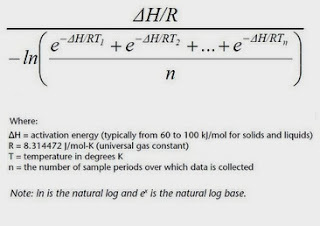 MKT is not a simple arithmetic mean but is calculated from the temperatures of stability chambers. Many software programs are available that stores the temperature from the stability chambers and also calculate the mean kinetic temperature directly. Degradation of any drug totally depends upon its storage temperature. When tablets are stored in a stability temperature, its temperature does not remain constant always. It varies up and down from the set temperature. Suppose we set a stability chamber at 30°C but it shall be 29.4, 29.8 or 30.6 many times in the specified period of time and we found the degradation of the drug by 0.6% in that period. Now mean kinetic temperature is calculated to determine the single temperature at which the drug would degrade by 0.6% in that period. is MKT required for API stability studies? If yes, pl also provide appropriate reason..